Tuesday we got our first taste of the spring to come. It was beautiful out, but we knew a blizzard, an actual by definition blizzard, was predicted for the next day. We rushed around outside to get as much done as we could. I took some pictures to share with you while I was out. Gus enjoyed the break in weather too. His short legs are not great for running in the snow. Some wet spots were filled in with mulch. More importantly, Henry got to sit in the digger, something he has been waiting months to get to do. 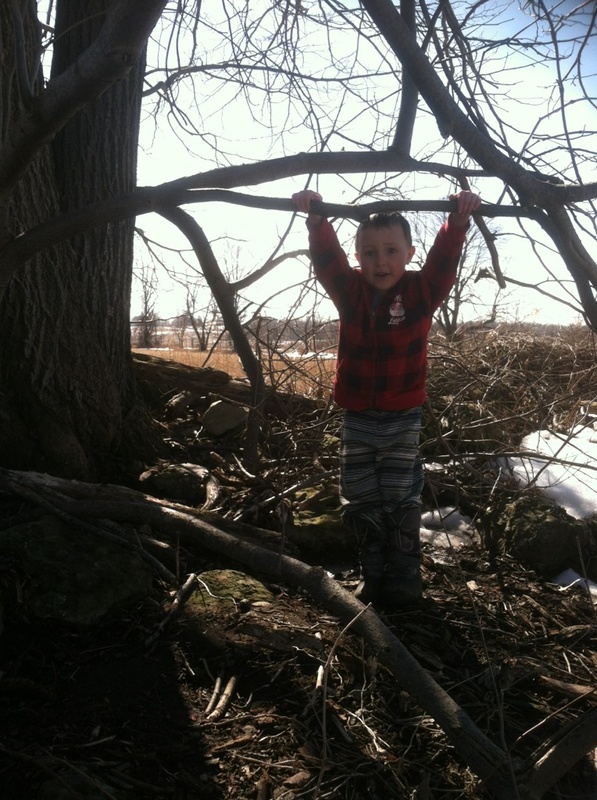 Freddy got to climb his tree unencumbered by snow pants. The cattle enjoyed a sunny rest. This big lady in front is Big Momma. See that big bulge on her side? Hopefully she will have a safe and healthy delivery soon. Our calf that was born just after Christmas enjoyed a little drink. Our shaggy haired boy is ready for winter to end so he can shed his itchy winter coat. Here is our new greenhouse! It is built into the side of the hill in front of the chicken coop. By building half underground we are able to take advantage of the insulating powers of the ground which means less supplemental heat is needed compared to a traditional greenhouse. Also, the ground should help keep it cooler in the heat of summer than a traditional greenhouse would be. I took this picture in the early afternoon yesterday. It continued to snow and blow for many more hours, leaving us with huge drifts of snow to deal with today. Tomorrow it is supposed to go back up to 50 degrees, so at least the snow won't last! Today we set up folding tables in the living room and got all of the seeds sorted and the seed starting trays organized. In the morning we are going to get some of the seeds planted and then get them situated in that new greenhouse. Spring really is coming! Posted on March 13, 2014 by Anna Kirkwood and tagged spring greenhouse cattle snow Gus.